April 9, 2013  The Louisville women haven't beaten UConn in 20 years — including a 22-point loss to the Huskies in the 2009 women's national championship game. And Connecticut breezed in their last matchup in January. But as any tournament watcher knows, January is ancient history when it comes to March — and April — madness. April 7, 2013  Connecticut fended off Notre Dame 83-65, and Louisville triumphed over California. The two winners will play in the women's NCAA title game on Tuesday. 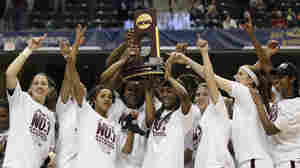 April 2, 2013  The Connecticut Huskies are going to a record sixth-straight Final Four. California is in the Final Four for the first time. Tuesday night, the other two slots will be filled. 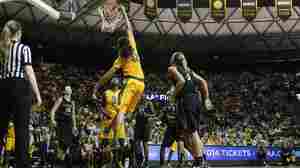 March 27, 2013  The NCAA women's Sweet 16 is set as Baylor's Brittney Griner hits 33 points — and three dunks — while Delaware's Elena Delle Donne passes the 3,000 career points milestone. March 18, 2013  Brittney Griner and Baylor are trying to become the fourth different school to win back-to-back championships. April 4, 2012  Led by superstar Brittney Griner, the Lady Bears beat Notre Dame 80-61. Baylor is the first basketball team in NCAA history — men's or women's — to win 40 games in one season. And the team did it without losing any.